Former Mariners star Alex Rodriguez is asking $6.5 million for a midcentury-modern residence, which was built in 1954. 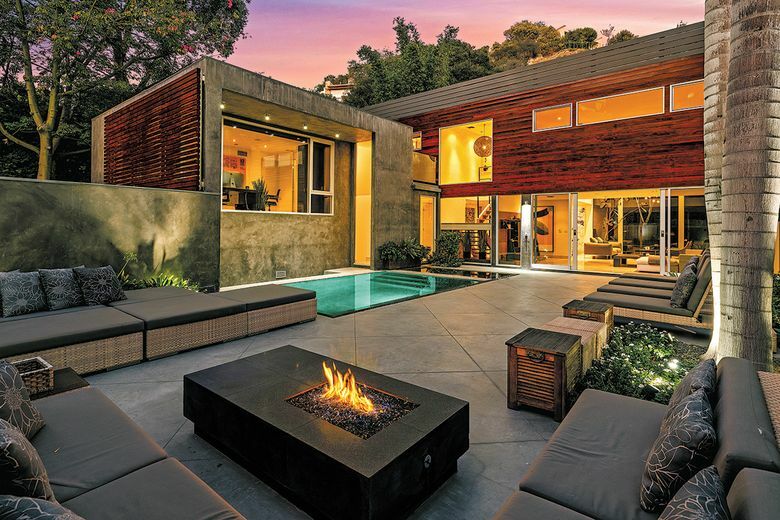 Former Mariners and Yankees star turned TV baseball analyst Alex Rodriguez is ready to give up his L.A. base, listing his architectural residence in Hollywood Hills West for sale at $6.5 million. Known as the Honnold & Rex Research House, the midcentury-modern residence was built in 1954 under the Architectural Products magazine research program, which encouraged experimentation with materials and designs. About a decade ago, it was redesigned and reconfigured by earlier owner and architectural conservator Xorin Balbes. Tucked away on a secluded drive, the home features horizontal louvers that wrap the exterior of the home and provide a privacy screen while diffusing light during the day and night. Clean lines, a mix of organic materials and walls of windows reinforce its modernist roots. At the heart of the house is a two-story living room with a block-wall fireplace that runs from floor to ceiling. The floor plan includes a chef’s kitchen, a dining room and a family room on the main floor. The master suite — one of four bedrooms and four bathrooms — floats above the living room area, allowing for city light and tree-top views. Rodriguez, who retired from baseball two years ago, bought the property in 2014 from Oscar-winning actress Meryl Streep for $4.8 million. Chosen first by the Mariners in the 1993 draft, the 43-year-old was among the most dynamic players in baseball during his career, amassing 696 home runs and 3,115 hits across 22 seasons. Rodriguez’s scores of accolades include 14 All-Star Game appearances, 10 Silver Slugger awards and three American League MVP awards. Since his retirement, he has worked as a broadcaster for ESPN and Fox. He recently bought a home in New York City with partner Jennifer Lopez.